An message on a WhatsApp group from a friend about his booking to Raipur set off the thinking process. He was flying there to attend the annual railfans gathering, the IRFCA Convention, behind hosted at Bhilai. I had been a member of IRFCA (Indian Railways Fans Club) since the early 2000s (2003, if I remember that correctly). Back in my school days, trains were an object of fantasy. I was always a bus fan, but trains were a different feeling. We rarely traveled by train those days, and my love for trains grew up as I made my longest ever train journey (then) in 1998, from Coimbatore (in Tamil Nadu) to Mumbai. Seeing my love for trains, one fine day, my brother introduced me to a website called IRFCA. He wasn't a train fan, but he came across the site searching for pictures of trains. I was an active member of IRFCA till 2009, where the changing environment around me, shifted me back to my childhood love, buses. Back in 2009, I had been a part of the committee that organised an IRFCA Convention in Bengaluru (Bangalore, then). A few years later, I wanted to attend another convention and made an attempt to do that in 2012 - but the bereavement of a member in my family cut short the trip. Its been 8 years since I attended an IRFCA Convention, and quite impulsively, made a decision to make it to Bhilai 2017 - the 13th IRFCA Convention. The first thing I did was look for tickets. It was a new year, and I had to conserve my leaves. My priority was to travel by the fastest means - ruling out trains, effectively. 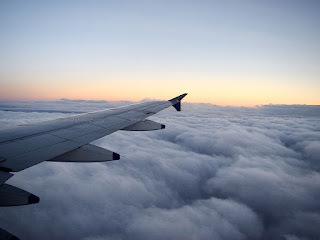 I looked at flights, and bagged cheap fares for my outward and return journeys, and booked my tickets a good three months in advance. 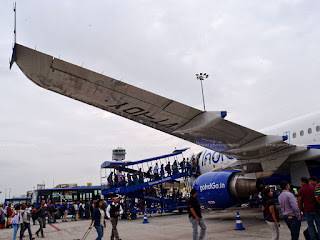 My outbound journey was by IndiGo 466, a one stop flight. A few days before my flight, I started noticing that this particular flight was regularly irregular, and often flew as much as 120 minutes behind schedule. 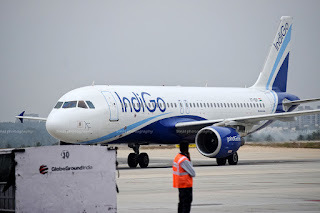 Then came a mailer from IndiGo, stating that my flight has been rescheduled due to flying restrictions in the national capital for Republic Day Celebrations. The flight was rescheduled from 1545 to 1600hrs. This threw in a spanner to my travel plans - but nevertheless, gave me enough time to be prepared for more delays. I did not want to take chances, since I knew the crowd at the airport, and the traffic on the road would be high, since it was an extended weekend for IT folks in town. I booked a cab for a 1230hrs pickup, and the cab turned up well before time. The ride to the airport was slow, it was traffic all the way. The driver was sane even after he entered the highway to the airport - he did not exceed the speed limit anytime, and took me to the airport by 1410hrs. I was quite surprised to see a rather deserted entrance to the terminal. I was shocked to find the IndiGo check-in counters deserted as well. 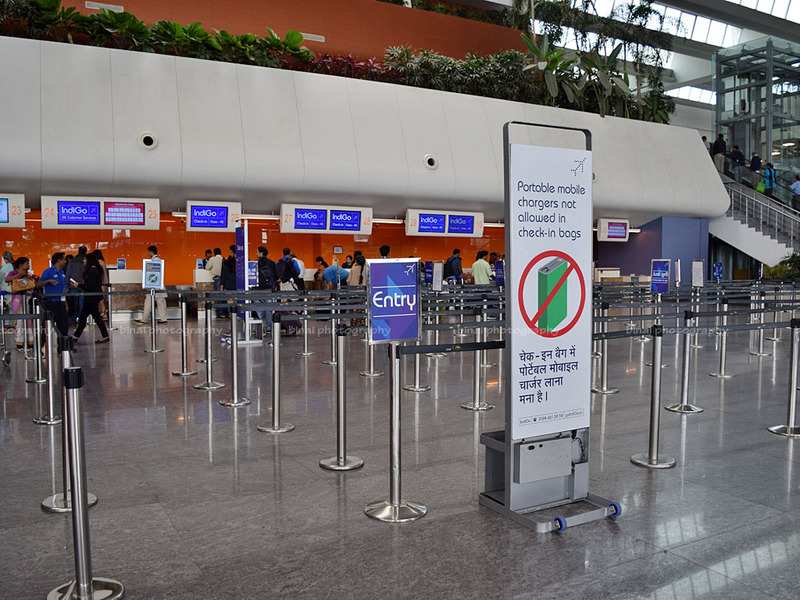 I was done with check-in in less than 5 minutes since reaching the airport, and headed to the security check. Security check was deserted as well, but the security staff did their job quite slowly, and delayed the entire security check process. IndiGo :Dear IndiGo Customer, gate no. 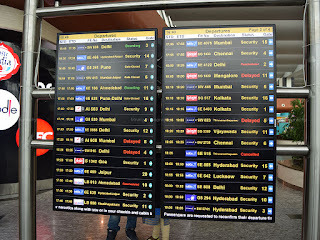 for your flight 6E-466 from BLR to RPR is changed to 14. Gate closes 25 mins prior to departure time. Have a pleasant flight. Another delay! I fired up FlightRadar24, and found that the aircraft was not even half its way to Bengaluru. I kept tracking my aircraft on FR24 to predict chances of any further delay. Since I had lots of time to go, I remained in the Lounge and caught up with some pending work I had, and composed part of this report as well. Sometime around 1600hrs, I had some snacks from the lounge and headed towards the gate. Gate 14 is located towards the farther end of the terminal building, and is located on the ground floor. FIDS @ BLR. 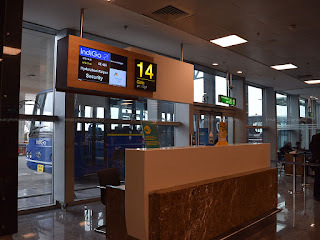 A Small arrow next to the gate number shows which direction is the gate situated at. As I reached the gate, I realised that they had silently rescheduled the flight further, and was now estimated to depart at 1730hrs. The gate area was crowded - a lot of flights seemed to be rescheduled, and almost every gate was crowded. I was constantly monitoring the movement of my aircraft on FR24, and understood that the aircraft had commenced its short finals. 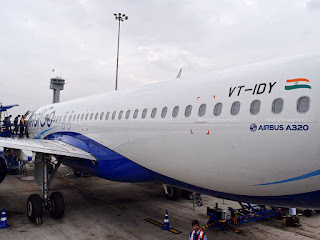 The aircraft I am talking about was VT-IDY - one of the six CFM56 powered A320s in an otherwise IAE dominated IndiGo fleet. 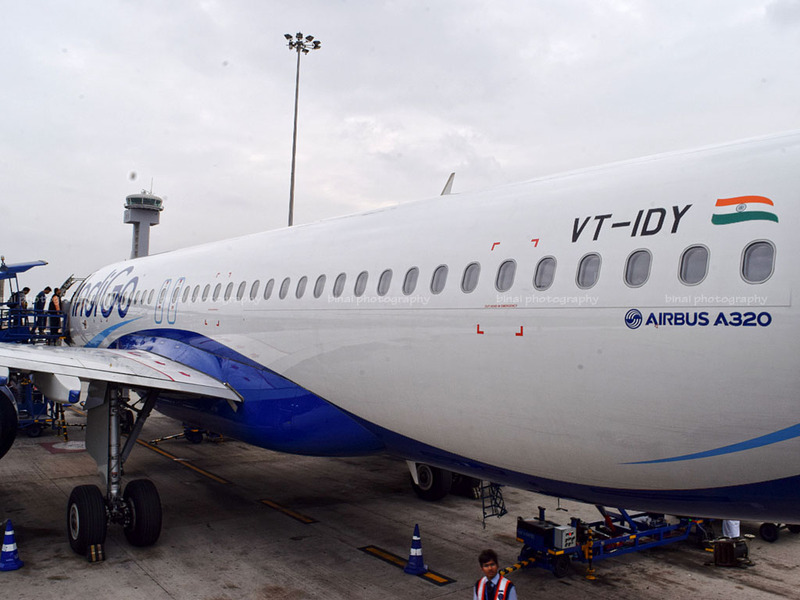 IDY was first delivered to Go Air as VT-WAN in September 2010, who returned the aircraft to its lessor in August 2016. The aircraft was delivered to IndiGo in October 2016, in its present registration, VT-IDY. She touched down 1655hrs. Since some maintenance work was being done on the taxiway, the aircraft taxied through the apron towards its remote stand. The first boarding call was made right after the aircraft taxied past the gate. A long queue of restless passengers had already formed, and people seemed quite relieved to get on to the tarmac coach. I remained till only a few of us remained to board. I got past the gate by 1704. 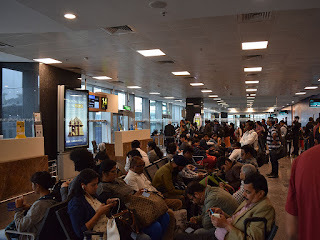 Quite surprisingly, there was really poor co-ordination among the ground staff - while the check-in gate cleared passengers, there were no coaches to take them to the aircraft! 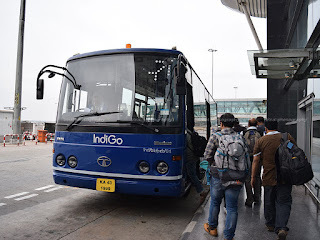 After a minute of wait, a coach turned up - the driver asked passengers for the flight number, and later asked the ground staff for bay details. We got to the aircraft by 1710hrs - but boarding hadn't commenced yet. The two buses that went before mine were still waiting. We were permitted to alight from the bus by 1713hrs. There was a long queue to board, already! I was inside the aircraft by 1718hrs. Boarding through the aft door.. the IndiGo Ramp in full flow..
One last shot before I get in..
Boarding seemed to be happening really slow, and we completed boarding only by 1724hrs - this meant, we wouldn't be able to depart even at 1730hrs. Doors were armed by 1728hrs, and the barrage of announcements commenced. Captain Mukesh Sharan and First Officer Akarshitha Roy were in charge. Anubhuti and her team looked after the cabin. We were pushed back at 1729hrs, but had a long wait before we could commence taxi, due to other aircraft on the apron. We commenced taxi at 1734hrs, and had a long run to Taxiway A6, the holding point of Runway 09. We finally took off at 1742hrs. We took off to the east before setting course to the North East. The seat belt sign was turned off by 1753hrs. An announcement was made that they would be serving only passengers with a prebooked meal, and others could use the call button if they wished to buy something. I had prebooked a meal, and I opted to have it in the second leg - the FA handling my row, Ms Ishita, made a remark about that in her chart and she moved on. It seemed like most passengers opted to buy something on board - could be that the delay made more people hungry. Oh yes! My flight, 6E466 has a stopover at Hyderabad. The flight was largely uneventful. There was a bit of turbulence as we neared Hyderabad, and the seatbelt signs were turned on at 1813hrs. A landing call was made at 1819hrs. We touched down on Runway 09R, at 1829hrs, and taxied to a remote stand. We docked at stand #11 by 1833hrs. Deplaning started quickly, and completed by 1840hrs. 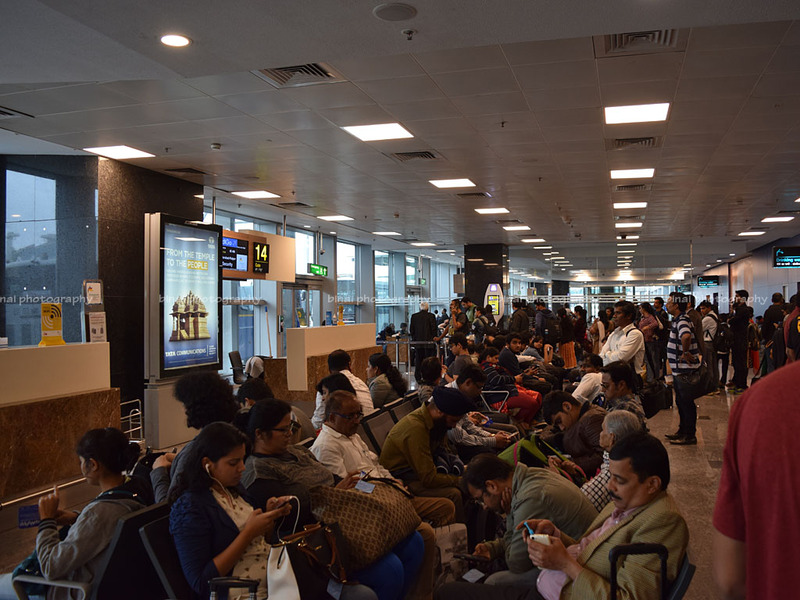 Soon as all passengers to Hyderabad got off, an army of housekeeping personnel barged in. 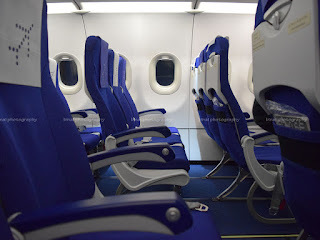 They had a clear split in what they do - one person cleans the seat pockets, one person sets the seatbelts in order, another person clears the thrash. 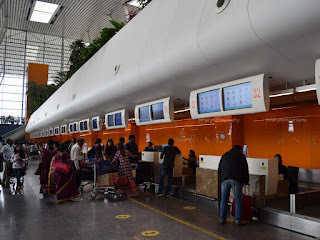 In the meantime, ground personnel came in with passenger manifest and cross-checked boarding passes, and confirmed that there were claimants for all the hand baggage on board. 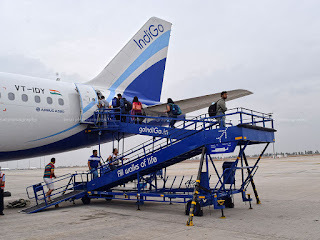 I really liked the way their housekeeping personnel went about keeping the aircraft clean - and I really appreciate IndiGo for the way they handle quick turnarounds. As we were doing this, the first bus with passengers for the next sector had already arrived. There were fairly good loads to Raipur - there were atleast about 60 passengers carrying on to Raipur. Boarding for the Hyderabad-Raipur sector commenced at 1846hrs. Boarding was quick this time, and we were done by 1855hrs. Doors were armed by 1859hrs and we were pushed back at 1906hrs. There was a delay in push-back due to congestion in the apron, as informed by the captain. While Captain Mukesh Sharan continued to be in command, First Officer Alex George had now taken over. The cabin crew hadn't changed. We commenced taxi at 1911hrs. We entered Runway 09R at 1917 via A8, and we had a rolling take off. We were airborne by 1918hrs. The climb out was very quick, and seatbelt sign was turned off by 1922hrs. 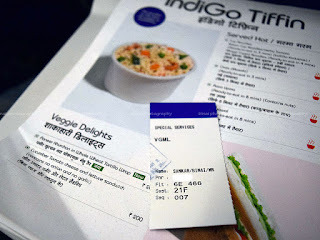 This time, again, it was announced that only passengers with prebooked meals would be served. Ms Ishita remembered my request, and she came down to my seat as soon as service began and took my order. 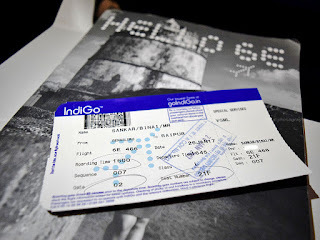 The stub on the boarding pass, and my options! 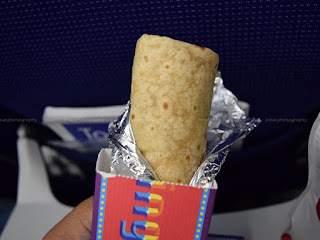 The IndiGo Tiffin menu seems to be becoming smaller and smaller every month - my favorite item, the Sub was gone, and there were just options - the mundane Tomato Cucumber Cheese and Lettuce Sandwich and a Paneer Khurchan in Whole Wheat Tortilla Wrap. I opted for the latter. Ishita literally surprised (or shocked) me when she asked what would be my alternative choice if the wrap wasn't available on board - come on! There are just two choices! I opted for a Paper Boat Anar drink to go along my roll. I did get the roll, and not the dreaded sandwich. The roll was cold - infact, the FA mentioned that it was cold, and not hot, as she served it. The roll was made of a whole wheat tortilla, with a filling rich in Paneer (Cottage cheese). I really liked the roll - the quantity of Paneer was the real highlight. The Paneer was soft and properly cooked, while the filling in itself was neutral on spices, and the flavour was neutral. The roll had impressed me last time as well. This time the roll was prepared by LSG SkyChefs at their Bengaluru kitchen. 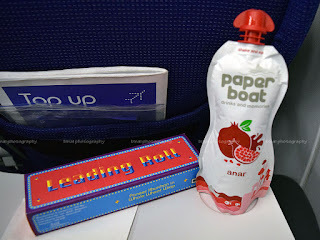 The drink, Paper Boat's Anar (Pomegranate) juice, was good as well. Weather appeared to have worsened - the seatbelt sign was back between 1926hrs and 1930hrs, and then again at 1946hrs. The second time, the turbulence was quite bad, and the captain asked cabin crew to be seated. A quite cabin clearance was done, and the cabin was prepared for landing as well. We touched down at Runway 24 of Raipur's Swami Vivekananda International Airport at 2010hrs. Reversers were in full application, along with heavy braking. The sole runway (06-24) doesn't have taxiways, and we carried on with the turnpad at the 06 end of the runway, and backtracked to the apron. We reached a stand by 2015hrs. Its a small airport, with two jetways - we did not use a jetway, though. Deplaning commenced quickly, and I was out of the aircraft by 2019hrs. It took a long time to get my checked-in bag. I got my bag only at 2034hrs. 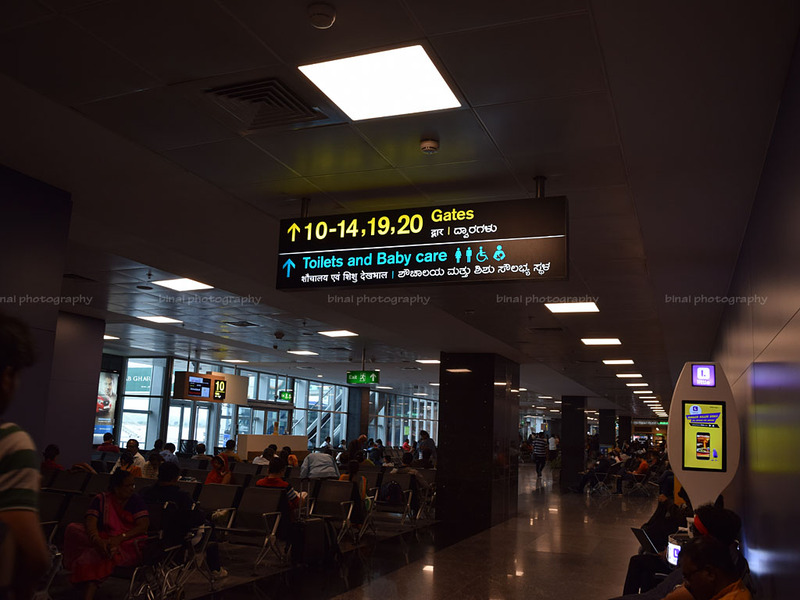 The airport had poor public transport options, and I had no option but to hire an expensive taxi - thankfully, there were two more people traveling to the same convention, and we shared the expense. My 10th flight with Indigo. Another clean flight with great, well maintained interiors. The crew continue to be largely mechanical, especially the seniors who come in as cabin crew incharges. I continue to have a grouse on the terrible inflight catering menu - there is hardly anything to choose from. Hot meals aren't served on flights with less than an hour of flying, and one ends up having to choose between a Sandwich or a roll! If only they gave more choices. This was another good flight with IndiGo.